On a walk through the Seymour Market recently I noticed a council display putting forward some logo designs for the new town branding. All four of the designs were a Military Theme. As it happens, I have been reading a book about the history of Seymour called 'New Crossing Place' by H. G. Martingdale. The impact of the railway on the town was enormous, and I felt that council should consider, and offer as an option, the branding of Seymour as a Railway Town. The Yarra Parlour Car (1906), refurbished in 1964. A stunning display at the Seymour Railway Heritage Centre that was originally used by people who thought that first class wasn't good enough, and paid for the privilege. The X31 loco (1966) at the Seymour Railway Heritage Centre. For every one diesel introduced from 1965/66, two steam trains were scrapped. "...during consultations undertaken to date (around 180 people have provided opinion already at public displays of the brand throughout the town) the Military Theme has gained strong support. I would say overwhelmingly – above 90% of people support this approach. People are generally proud of Seymour’s military heritage and history and are happy to support the approach. Railway Heritage has been mentioned but only by a very small minority." While there seems to be strong support for a Military Theme for the town, there was no alternative offered. I began asking what other local people felt about the Military Theme and was not surprised to hear that most people had no idea that the branding exercise was happening and that most people that I spoke to preferred the Railway Town branding alternative as an option. I contacted the editor of the Seymour Telegraph, our local newspaper and asked if he would be interested in the story. He was "more than interested", so I wrote the following article. The role of Seymour as a 'crossing place' along the Goulburn River was transformed after the floods of 1870, when the railway arrived in 1872. 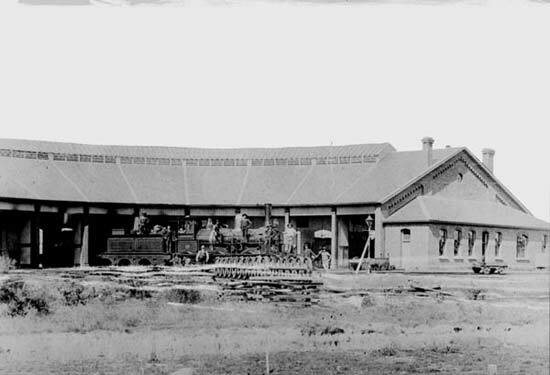 With the addition of a Goods Shed later that year it became the first railway town in Victoria. 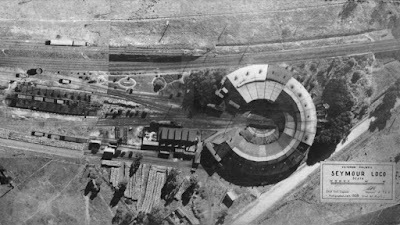 The town centre gradually moved east from Emily Street to the higher ground at Station Street to avoid the risk of flood damage and take advantage of the commercial benefit of the new railway station. The railway became a logistical hub and a boon to the emerging farming economy that had relied on bullock drays, stage coaches and paddle steamers to transport people and goods. Being near the junction of three train routes brought with it large marshaling yards, an administrations and maintenance centre. At its peak the railway employed over 400 men and about one third of the towns population were railway families. The refreshment rooms at the station became the largest in country Victoria that once employed 34 people and catered for 150 in the buffet and 112 in the dining room. With the arrival of cheap oil, cars and trucks took the place of many of the railways functions. Worldwide oil production is now declining and trains are once again becoming a preferred method for transportation. Trains are the most efficient form of overland freight / long distance passenger transportation that will reduce our greenhouse gas emissions and lessen our impact on climate change. Major investment has been made on upgrading the rail networks and patronage has increased on regional lines by over 100% during the last six years. In the transition to a low energy future trains will play a major role, and Seymour is well placed to support the revival. There are a number of existing enterprises, events and attractions in the district that support the branding of Seymour as a Railway Town. - The Seymour Railway and Heritage Centre, located near the heart of town, with tours of vintage locomotives, magnificent parlour and royal cars and an assortment of carriages. - Regular heritage train tours that run from Seymour to locations such as Tocumwal, Geelong, Melbourne, Marybourgh and Creswick. - The restoration and maintenance of locomotives and carriages by local volunteers at the Heritage Centre. - The Goulburn River High Country Rail Trail which runs from Tallarook to Alexandria / Mansfield (134km) due for completion at the end of 2011. Funding is currently being sought by council to extend the trail to Seymour. - The grand buildings of the Seymour railway station including the largest country refreshment rooms in the state. - The 'Tastes of the Goulburn' food and wine festival, held at the station each year for the last 10 years - usually featuring heritage train rides. - The high profile steam train at the JW Elliot reserve on Anzac Avenue, opposite the train station. Further investment in developing the Heritage Centre as a major tourist attraction would bring with it more business to the heart of Seymour. It's location, an easy walk from the station, brings people to the doors of local shops. With picnic areas nearby, pubs, restaurants and take away food stores along Station Street there's plenty of reason for visitors to stick around. Not to mention the Post Office Gallery, Goulburn River Walk, the Vietnam Veterans Commemorative Walk (that will be constructed), the Light Horse Memorial Park and Bushland reserve further afield. The refreshment rooms at the station have great potential to become a social hub for the community, much like Maryborough Station which has a café, wine bar, art gallery, antique store and holds markets that attract around 3000 visitors each market. Building on the Tastes of the Goulburn, Seymour stations refreshment rooms could build on the existing café and offer gourmet local foods and wines and display local artwork and crafts with more support from the local community. Perhaps a restaurant, food co-op, or model train display in the unused dining rooms along with a community market in the park could add to the attraction? Will a Military Theme benefit local business? The councils current proposal to brand Seymour with a military theme does not bring visitors into the heart of town. The main military attraction to the area is the Tank Museum in Puckapunyal. The Commemorative Walk and Light Horse Park are attractions that support the rich heritage of the railway, which originally attracted the military to the area, but are not major tourist attractions in themselves. A military theme would best be reserved for Puckapunyal, where the military reside. 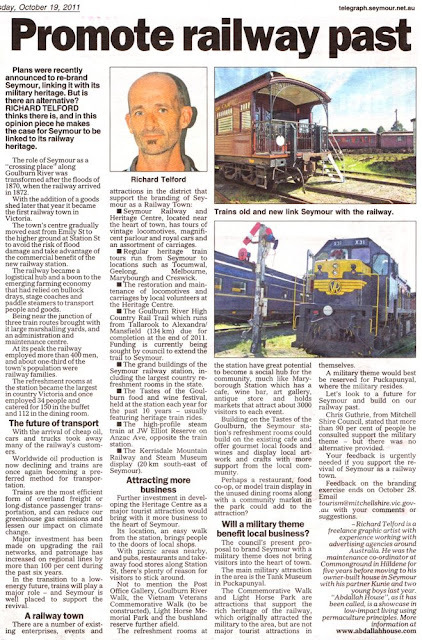 Let's look to a future for Seymour and build on our railway past. Chris Guthrie, from Mitchell Shire, stated that over 90% of people he has consulted support the military theme - but there was no alternative provided. Your feedback is urgently needed if you support the revival of Seymour as a Railway Town. Feedback on the branding exercise ends on Friday the 28th of October. Email [email protected] with your comments or suggestions. 'Seymour Loco' (Seymour Locomotive Depot) 1950. To the left of the picture is the coal stage, an elevated track that was used to transfer coal. Large amounts of firewood stacked at base of photo, used to start off the boilers. The large roundhouse (now demolished) was a maintenance shed built around the turntable, which is still in operation. Oak Street on bottom right of image. Since I wrote the article I have been contacted by steam driver Jim Rae, who worked in the railways for 38 years from 1949, and in Seymour from 1954. He worked with Jack Kidd, who was part of the maintenance crew, and the man who owned the bungalow that I deconstructed and turned into Abdallah House. He brought around the Seymour Loco photo above and told me all about what was happening in the image. This area is just 100m from my house, and looks nothing like this now, none of the buildings remain. I am looking at recording an interview with Jim as he discusses the history of the railway heritage of Seymour. Principle # Hazel: beware of turning into a media tart. Only joking. I do not live in Seymour, but do visit occasionally as I live about forty minutes away. i love the idea of the railway branding rather than military...let Pukapunyal have that! Good on you for putting it forward...good luck. It is a lesson in polling. The answer depends on the question/s being put. A few politicians should learn that rule. By the way...I love your blog and everything your are trying to do. The rebranding of the first two towns Seymour and Kilmore: should be very obvious. Kill more - by military. Very clever TC! That gave me a giggle. Richard, thank you for pointing this out. I knew about the branding but had no idea they were going for a military theme! Rest assured, I have had my say to the council. The village I live in http://www.chipmannb.org has as its motto "village of industry". What they mean is Forestry, and so its logo is a truck loaded with dead trees. How I hate that picture! Nowadays, there's only one sawmill left, so when I designed the new website, I left that image out entirely. 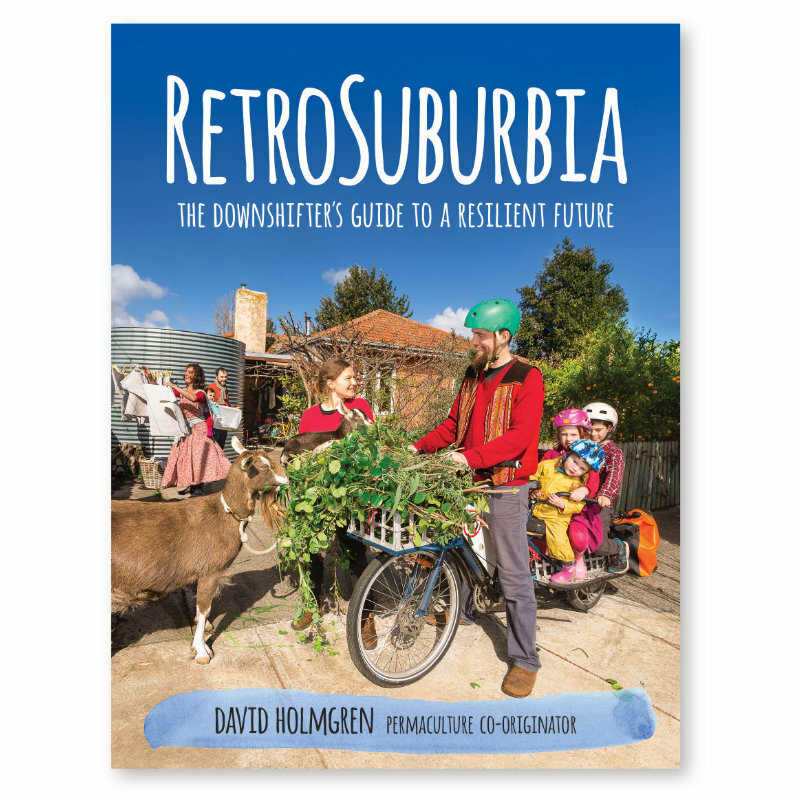 Thank you for your story: it encouraged me to try and present to Council the idea of "rebranding" Chipman into something more acceptable for today's values.